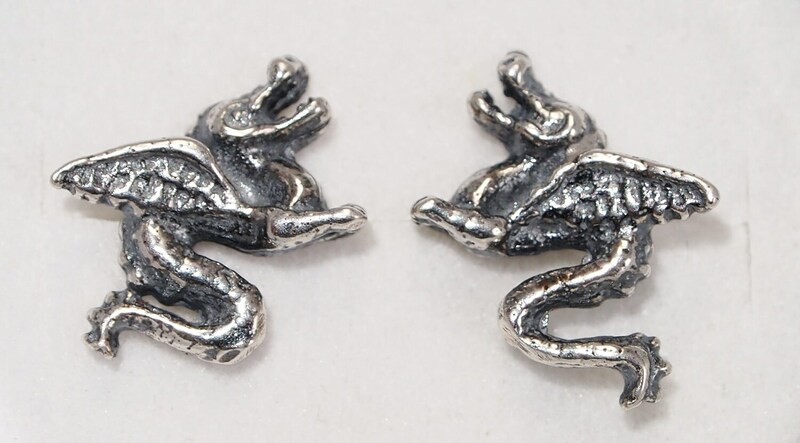 These handmade sterling silver dragon earrings design are from a collection of master designs I got from a retiring jeweller here in Montreal. They are 1.2cm wide and 0.9cm high with a sterling silver post. The design is a left and right mirror design. The original design dates from the 40's-50's, but I made a new mold and started making them in silver to introduce to a younger audience! I always love to change my look with a pair of earrings, and of course dragons are first on my list! . They are small enough to wear in secondary ear hole or be centre stage! I have been looking for these earrings for years. These dragons have been a cherishes part of my wardrobe for years and I was upset I could not find them until now! They are absolutely gorgeous and are actually super light! I would highly recommend these, especially to anyone who have been searching for this lost pattern!